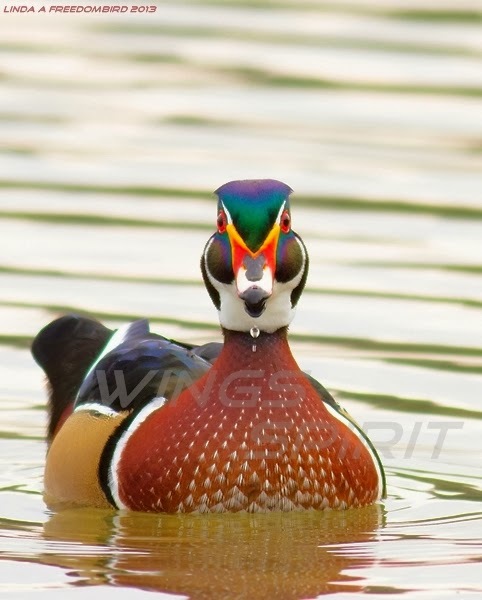 Male Wood Duck (Aix sponsa) is stunning pretty with iridescent green, purple and brown. Female is over all grayish brown with a white eye ring. 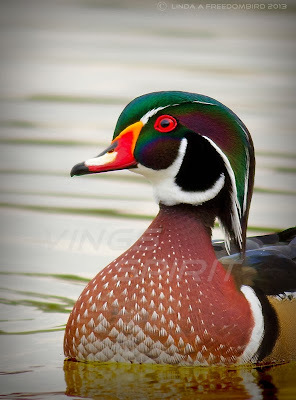 Unlike most waterfowl, Wood Ducks are cavity nesters, perch and nest in trees and are comfortable flying through woods. Their broad tail and short, broad wings help make them maneuverable. When swimming, the head jerks back and forth much as a walking pigeon's does. You often see Wood Ducks in small groups (fewer than 20), keeping away from other waterfowl. However, I spotted this stunning male mingling with a flock of Mallards! One time, someone told me when you have your telephoto lens with you, you don't have to take your binos. This person is a photographer not a birder. I think I need to reconsider what this person said.